The CanDo® Rickshaw™ Rehab Exerciser is designed for people who use a wheelchair to strengthen their arms and shoulder muscles. Stronger arms are needed for propulsion, transfer, and pressure reduction lifts. 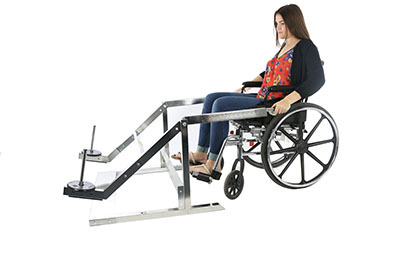 The Rickshaw™ Rehab Exerciser is ideal for in home use or at facilities under a therapist's supervision. 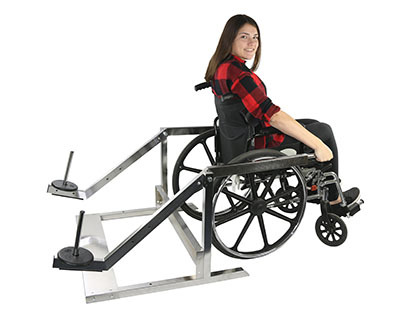 Its innovative design allows users to be facing either forwards or backwards from the machine and can be used with both arms in tandem or a single arm workout by removing the crosspiece. 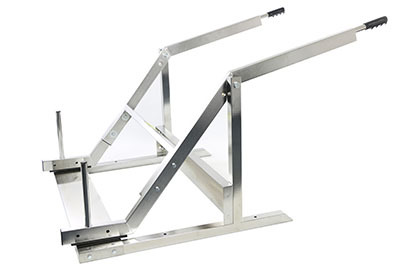 The heavy-duty steel construction fits around the width of any standard wheelchair with ease. It is latex and silicone free and does not come with free weights. Dimensions: 50" x 32" x 36"